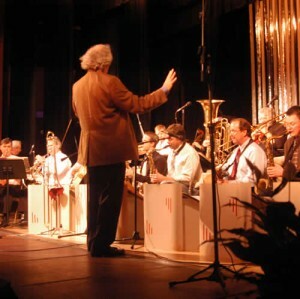 Every Monday night, the 21-piece Vaughn Wiester’s Famous Jazz Orchestra plays at the Clintonville Woman’s Club, 3951 N. High St., Columbus, just north of the Park of Roses. This is one of the best big band jazz bands in Central Ohio, playing Count Basie, Stan Kenton, Duke Ellington, Dizzy Gillespie, Miles Davis, Woody Hermann, Terry Gibbs, and many more. Vaughn and his Orchestra have produced 3 CD’s over the years. Vaughn Wiester is a jazz historian, and former Woody Herman Band trombonist. Several band performers have been members of well-known big bands around the U.S. (e.g. Tommy Dorsey, Guy Lombardo, Terry Gibbs, Glenn Miller). Guest vocalists and instrumental soloists are occasionally featured on the Monday performances. Visitors can come and go any time between 7:30 and 10:45. (7:15 for best seats). $10, $5 for students. Very ample parking.